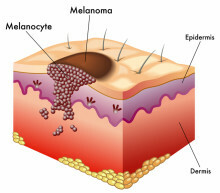 Basal cell carcinoma is the most common of all skin cancers. Though it doesn’t spread like melanoma, it can cause disfiguring scars if not identified and treated early. Basal cell carcinoma starts in basal cells; the cells that line the top layer of skin and produce new cells as old ones die. 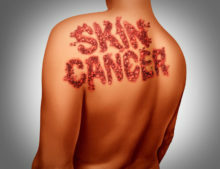 As with other types of skin cancer, the cause of most basal cell carcinomas is cellular damage resulting from excessive exposure to ultraviolet (UV) light from the sun. Most basal cell carcinomas are found on areas of the skin that have received a lot of sun exposure; like the face, scalp, neck, shoulders, and back. One of the hallmark signs of a basal cell carcinoma is an open sore that bleeds or crusts over and never seems to heal. 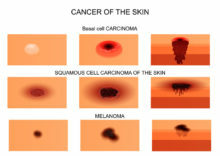 The cancer can also form a shiny or waxy bump, sometimes with blood vessels running through it. Or, it can take the form of a scaly reddish patch. In rare cases, basal cell carcinomas resemble a white, waxy scar. If you notice any growth that’s new or changing, call your dermatologist for an appointment. The doctor will do a biopsy, removing a small sample of tissue from the growth to check it for cancer. For small cancers, the doctor can use a tool called a curette to scrape it off, and then seal the skin underneath with an electric needle. In Mohs surgery, the doctor removes thin layers of the tissue, one at a time, examining each layer under a microscope until all the cancer cells are gone. For larger cancers, the dermatologist can use a scalpel to remove the whole growth, along with some of the skin around it. This is called surgical excision. Lasers, radiation, and freezing are other methods used to remove basal cell carcinoma. Cancers that are not very deep may be treated with topical drugs such as imiquimod (Aldara), and fluorouracil (Carac, Fluoroplex, Efudex).